The skin is the largest organ of the body; there is a wealth of research that identifies why certain nutrients are essential for keeping our skin looking healthy. All these nutrients can be found in natural foods and should be added to your plate for beauty. People who cut out all fats from their diets to encourage weight loss will most likely suffer with dry, aged skin. Essential fatty acids like omega-3 and omega-6 help build cell membranes that keep the skin’s natural oil barrier intact, ensuring soft, plump skin. Include ingredients with good fat content, such as coconut, olive and algae oil, oily fish, avocados, seaweed, chia seeds, flaxseeds and nuts. We’ve all heard of antioxidants, but what do they actually do? Well, they limit the production of free radicals, which can damage skin cells and lead to signs of early ageing. They also help protect the skin from the sun’s harmful UV rays. There are many skincare products that contain added antioxidants and vitamins, but I say remember to get them straight from the source and eat them up. Antioxidants have a great anti-inflammatory effect and reducing inflammation promotes a more even skin tone, keeping acne and wrinkles at bay. Good sources of antioxidants to stock up on include black beans, black rice, green tea, dark chocolate, moringa powder, red grapes, baobab fruit powder, spinach, kale, artichokes and broccoli, and, of course, berries. Rather than just eating bucket-loads of blueberries to get all your antioxidants, it is far more beneficial to eat a whole range of the foods mentioned above and in the following paragraphs. It’s really important to take a balanced approach to getting all the nutritional value from ingredients that your skin needs through your diet. I believe that is why the world is blessed with such a huge variety of foods, so that we can try different flavour combinations and still find everything we need in nature to keep our bodies feeling healthy and looking great. Vitamin A is transformed into retinol in the body, which is essential for clear skin. Studies have shown that retinol helps to keep the skin firm by increasing the skin’s collagen production, creating healthy cells and increasing skin support substances, such as ceramides. Great sources of vitamin A are all the orange-coloured vegetables, like butternut squash, carrots and sweet potatoes, as well as beetroot tops, green beans, spinach, dark cabbage and kale. Vitamin C is essential in the production of scar tissue, blood vessels and cartilage – it is also a powerful antioxidant and helps promote collagen production. Great sources to stock up on are apples, apricots, citrus fruit, pears, kiwi, guava, papaya and mango, yellow, orange or red peppers, dark green leafy vegetables, cauliflower, Brussels sprouts, radishes and tomatoes to name just a few! Vitamin E is a potent antioxidant that helps protect the skin from sun damage. It cannot be produced by the body, so we need to make sure we eat enough to replenish the body’s store. Good sources (that you can find easily without having to buy supplements) are tofu, almonds, hazelnuts, sunflower, pumpkin and sesame seeds, avocados, oily fish, like salmon, trout and herring, prawns and swordfish. It is also present in spinach, kale and turnip greens, as well as wheatgerm, olive, grapeseed and sunflower oils. Many people find that just eating avocados regularly can do wonders for your skin. I try to have a quarter or half every day. Avocados are packed full of oleic acid, an omega-9 fatty acid, and healthy monounsaturated fats. These play a very important role as one of the building blocks of healthy skin by keeping the epidermal layer of the skin soft and hydrated. Oleic acid also helps regenerate damaged skin cells and reduces facial redness. Avocados are also an excellent source of vitamin E, antioxidant carotenoids and vitamin C.
Add all the ingredients to a blender and whizz until you have a really smooth smoothie. You can add more milk if you prefer it to be a little runnier, and if you prefer it sweeter just add a little more honey. Note: High in unsaturated fats, this is great for complexion and hair strength. Blueberries and blackberries are great for your skin as they contain high amounts of vitamin C amongst many other vitamins and nutrients. Vitamin C is essential for the development and maintenance of scar tissue, blood vessels and cartilage, which in turn helps reduce fine lines and wrinkles. Plus these berries have high levels of antioxidants to help protect skin, too. Moringa is a superfood sold in powder form. First discovered in India, the moringa tree now grows in many tropical and sub-tropical countries. Best known for its high level of vitamin C (seven times more than an orange) and iron (25 times more than spinach), it has high levels of vitamin A and several B-vitamins, plus protein and calcium. 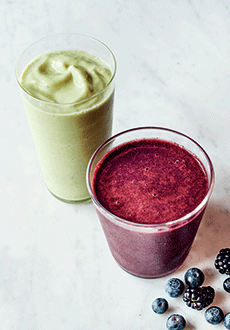 Add all the ingredients to a blender and whizz to a smooth liquid. Pour and serve. Extracted from Beauty Foods by Caroline Artiss. Photography by Ed Anderson. Published by Ryland Peters & Small. Beauty Foods will be available to Your Healthy Living readers for the special price of £10.99 including postage & packaging (RRP £14.99 by telephoning Macmillan Direct on 01256 302 699 and quoting the reference HU4).